Quick quiz (and don’t cheat by looking at the chart below): How many UConn players were on WNBA rosters last season? If you guessed a sweet 16, then congratulations, you are correct. 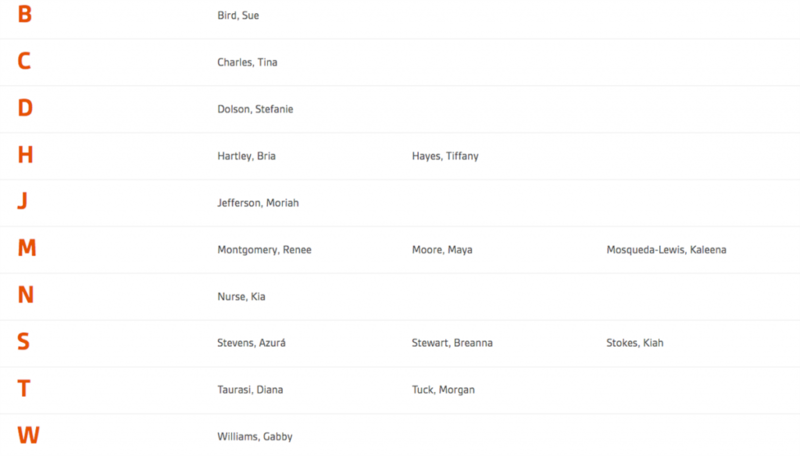 That’s over 10 percent of the entire collection of WNBA players coming from one school. That Geno Auriemma guy must be doing something right over in Storrs. All jokes aside, along with his 11 NCAA national championships, Auriemma and his staff have done an excellent job of preparing players to take the next step to the professional ranks. Five Huskies have been chosen as the No. 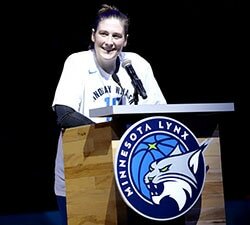 1 overall pick in the WNBA Draft – Sue Bird in 2002, Diana Taurasi in 2004, Tina Charles in 2010, Maya Moore in 2011 and Breanna Stewart in 2016. 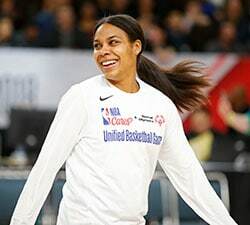 Four of those players have won league MVP honors and the only one that has – Bird – is the WNBA’s all-time leader in games played and assists and widely regarded as the greatest point guard in league history. This April, the number of WNBA players representing UConn will increase by two as seniors Katie Lou Samuelson and Napheesa Collier are both projected as first-round selections. In this week’s Senior Watch, we’ll take a closer look at Samuelson and Collier as they look to become the latest UConn to WNBA success stories. While the words success and UConn go hand-in-hand, the No. 2 Huskies are coming off a loss to No. 3 Louisville on Thursday night. It was the second loss of the season for UConn and the first time since 2012-13 that they lost multiple regular season games in the same season. For Samuelson and Collier these two regular season losses were the first of their collegiate careers. After going 39-0 and winning the national championship as freshman in 2015-16, the Huskies suffered only two losses over the next two seasons and both came in the national semifinals – to Mississippi State in 2017 and Notre Dame in 2018 – in heartbreaking fashion. But seeing tough competition and being in tight games now will only better serve them for when they turn pro. 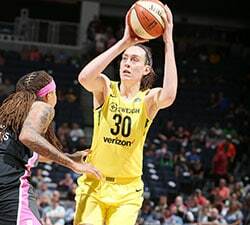 Just ask Breanna Stewart, who lost more games in her rookie WNBA season than she had in her entire life. UConn may prepare their players for a lot, but losing is not one of them. Against Louisville, Collier led the Huskies with 20 points, eight rebounds, six assists, a steal and a block, while Samuelson finished with 16 points, four assists and three rebounds. For Collier, it was her fourth straight game with at least 20 points and her seventh of the season. The 6-2 forward is averaging 18.7 points, 9.9 rebounds, 3.7 assists, 1.3 steals and 1.5 blocks in her senior season. She is shooting 58.2 percent from the field but is having an uncharacteristically tough season from beyond the arc as she’s just 6-27 (22.2%) from 3-point range. She entered the season as a 35.9 percent shooter from deep. Collier’s stat line illustrates her versatility and how she can find multiple ways to help her team. That is a bit of a hallmark of UConn players; since the team is loaded with talent on a yearly basis, there is less pressure on one single player to dominate. Instead everyone is able to play to their strengths and contribute in a variety of ways. Think of Gabby Williams, who was the No. 3 pick in the 2018 WNBA Draft. While at UConn she didn’t have the most eye-popping stats in any one category but was able to stuff the stat sheet and help her team win. Collier just became the eighth player in UConn history to reach 1,000 career rebounds and has a chance to become just the second player in program history (along with Breanna Stewart) to accumulate 2,000 points, 1,000 rebounds, 200 steals and 250 blocks in her UConn career. She’s 17 points away from 2,000 and 34 blocks away from 250; she already has the rebounds and steals. Versatility, efficiency and consistency are three attributes of Collier’s game that make her such a strong pro prospect. Speaking of threes, let’s turn our attention to Samuelson, who is one of the top shooters in the country and would be a welcome addition to any WNBA team with her ability to spread the floor. Samuelson shares the team lead in scoring with Collier at 18.7 points per game, while adding 7.0 rebounds, 3.5 assists, 1.2 steals and 2.6 3-pointers per game. She is shooting 35.9 percent from beyond the arc this season, which is down from her career average 42.9 percent entering her senior season and her outstanding 47.5 percent shooting as a junior. While she is an elite perimeter shooter, she has shown to be much more than a player to be stashed at the 3-point line waiting for catch and shoots. She can create shots for herself and others and is also a versatile defender thanks to a 6-3 frame and a high basketball IQ, which is another hallmark of UConn players. The Huskies will look to rebound from their loss to Louisville on Saturday when they face Cincinnati in an American Athletic Conference game. The Huskies are a perfect 93-0 in AAC play since joining the league. UConn faces one more non-conference opponent this season – South Carolina on Feb. 11 – before tournament time comes in March. Collier and Samuelson began their UConn career by winning the national championship as freshmen and will look to bookend their careers with a second title as seniors. And winning NCAA titles is as much of a UConn tradition as sending outstanding players to the WNBA. Senior Watch profiles the top WNBA Draft-eligible seniors playing in the NCAA. The views on this page do not necessarily reflect the views of the WNBA or its clubs.